I like virtual gifts. For a small sum of money a person who needs a sheep or a chicken or blankets gets what they need and I get a nice card saying what's been given. As I have just turned 40 and I wanted to throw a party I wanted to avoid ending up with a ton of presents that I don't really need. I have more than enough stuff. So I decided to ask people coming to the party that if they really, really wanted to, they could help me fill a wall with home-produced art or fill a farmyard with virtual animals and things. 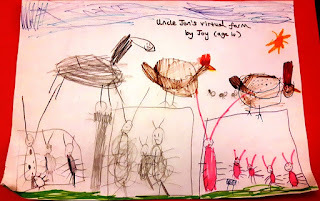 Some people combined both - my niece Joy drew me a sign for my farmyard. And people were incredibly generous. 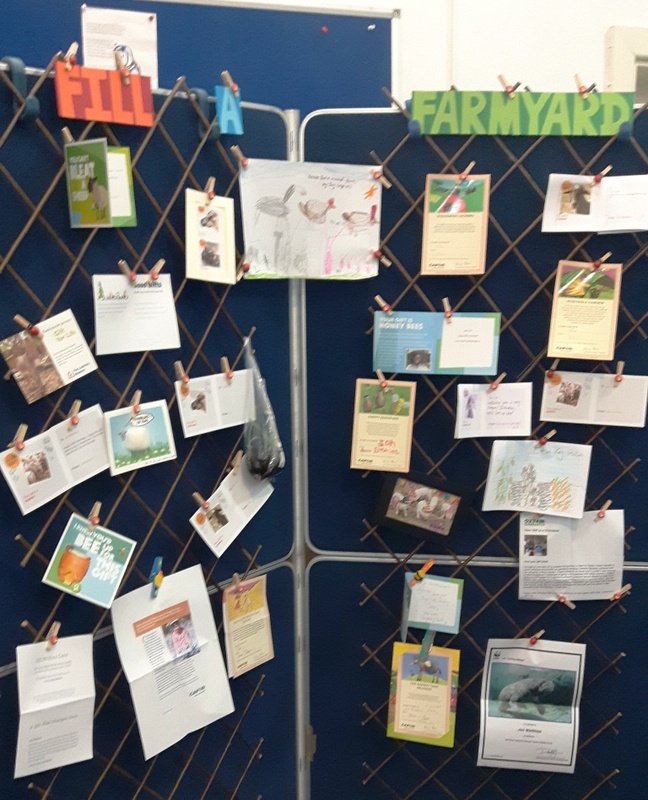 Most people turned up with some little envelope, or my inbox pinged with an email the day before, to say that donations had been made and virtual chickens, sheep, goats, bees (lots of bees!) and even donkeys had been 'bought' on my behalf for people who really needed them. For people who like knowing this sort of detail, here's the run down of what ended up on the farm. I was also given a $25 microfinance loan to be loaned out to the person of my choice in the developing world. I'm going to sort that out and blog about it later but it sounds like a brilliant idea. In a future post I'm going to blog about the art wall that got filled. But I wanted to show off my farmyard first. I'm very grateful to all the people who came to the party and who have helped so many people who are living in challenging situations around the world.